With Nutella and chopped almonds. 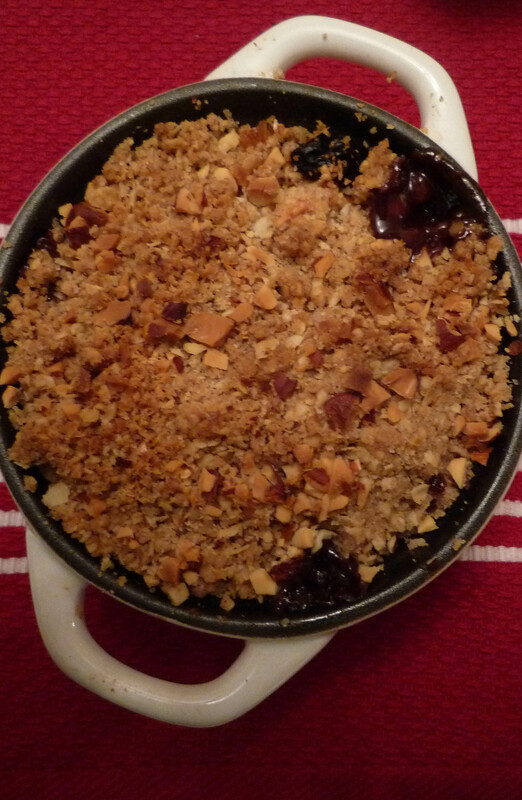 When I think of apple crumble I think of my mum as she makes lovely apple crumble, I also think of my dad as he loves his custard and apple crumble and custard work aaaamazingly together. I also think of cold nights and comfort as it’s ultimate comfort food. I have this slight obsession with Nutella (I don’t understand people who don’t like it? they are crazy!!!! chocolate and hazelnuts what more can you ask for? heavenly…yeh it’s not healthy but it’s just soooooooooo yummy) it is one of my favourite things and I think it works with anything too…in cereal, on top of cakes, cake filling, in smoothies, in hot drinks the list goes on & on & on. 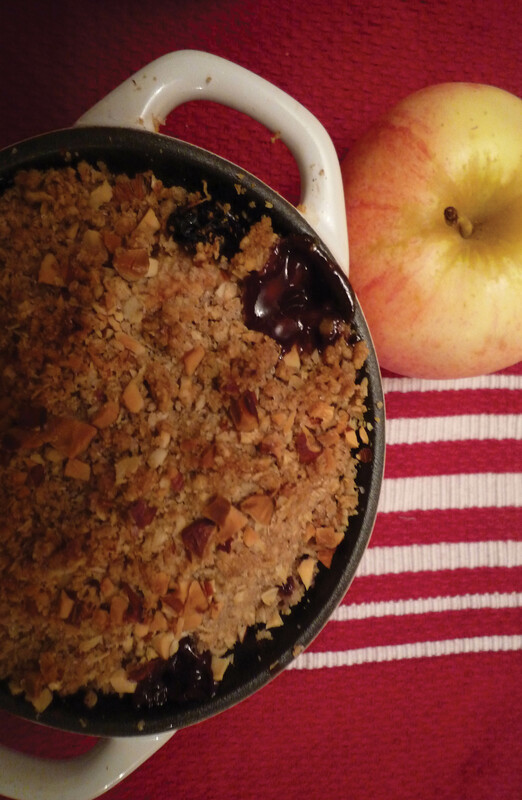 I wanted to incorporate a little bit the magical Nutella lovelyness in my crumble to obviously show it also works with crumble too. 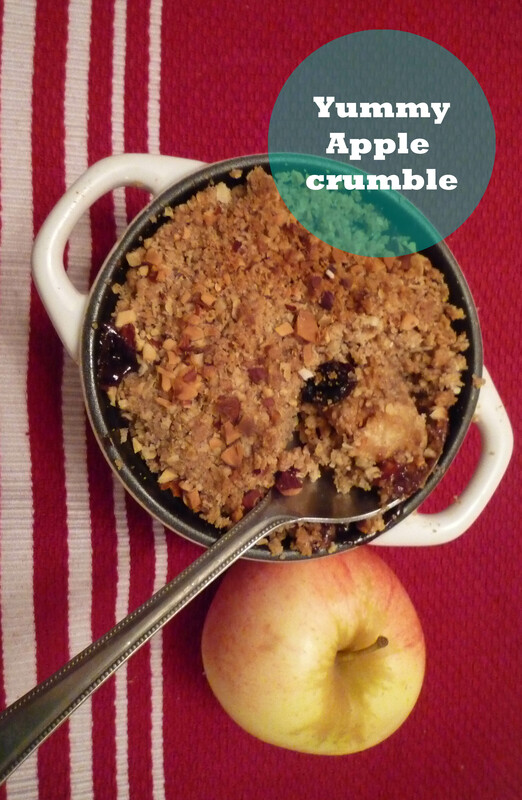 I’ve used my mums apple crumble recipe which gives a nice flapjacky style crumble as it contains oats. 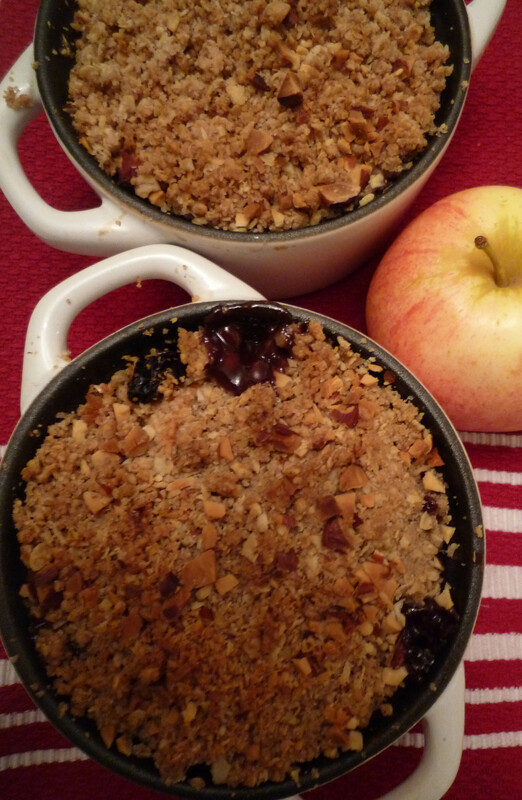 I also found these absolutely cuteeeeeeeee little casserole dishes and thought that apple crumble would be ideal for them. 3oz – Sugar plus extra to sprinkle on to apples (brown preferably, white can be used). 3-4 – apples depending on size and how big your dish is. 1. Preheat the oven at 175°C grease 4 ramekins/mini cassorole or a large dish. 2. Rub the butter into the oats, flour, 1 tsp of cinnamon and sugar until it resembles fine breadcrumbs. 3. Peel and core the apples and cut into small pieces, in a mixing bowl combine the apples, 3/4 tsp of a cinnamon and a good sprinkle of sugar. 4. At the bottom of the little ramekins/casserole place a good 1tbsp heaped sized Nutella and try to spread it round the dish it’s quite tricky! Just do the best you can (If using of a non stick dish spread the four heaped teaspoons across the bottom of the dish). Then add the apples evenly between the dishes. 5. 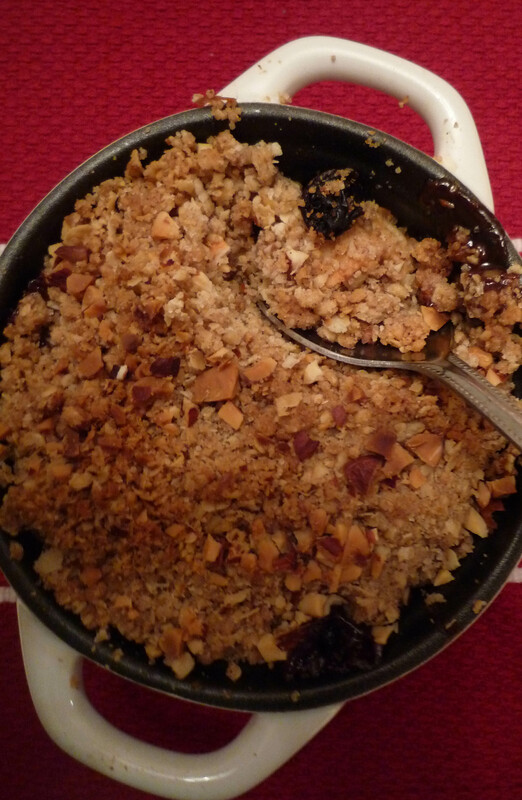 Add the crumble and then scatter the chopped nuts. 6. Cook for 40-45mins check for the Nutella or juices of the apple bubbling up to the surface. Enjoy :) you can serve it with custard or icecream. 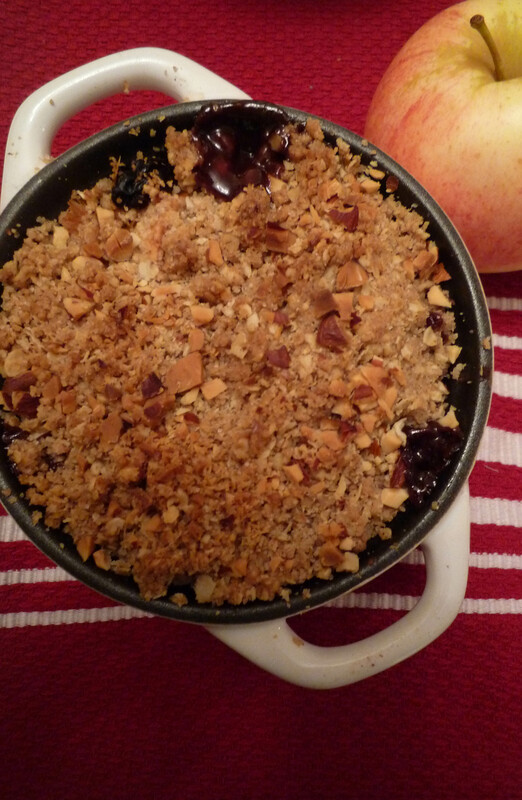 *If you can’t manage the whole apple crumble in one night which I couldn’t do (surprisingly) then leave it in the fridge overnight and eat it the next day. The flavour soaks in much more and it tastes even more yummier.